We met in Stuttgart at Camflight. 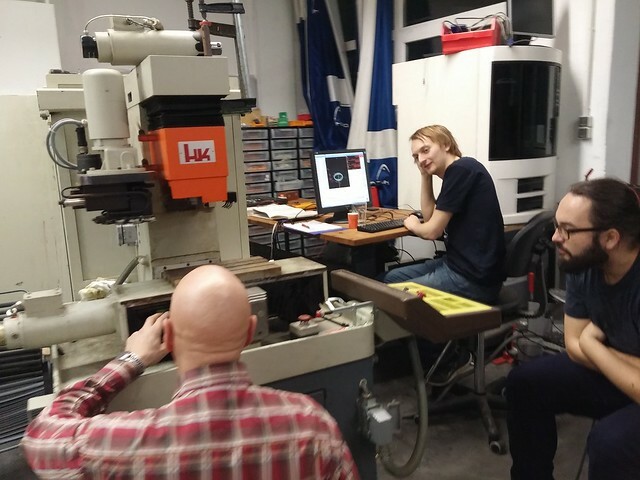 The founder Andreas 'Ruffi' Ruff is a great host and his workshop is an awesome playground for CNC enthusiasts. We put his machines to good use during the days of the event, fixed some bits and bobs and learned a lot. The machine park is impressive. All of us enjoyed free access and introductions for the tools on site. It didn't take long and most of the empty tables in the main hall were covered with top notch soldering tools, beefy power supplies, mixed domain oscilloscopes, FPGA boards, thermal cameras, spindles with TCs, servo motors, two robotic arms and fresh out of the Galden filled asparagus pot, a batch of STMBL open source servo driver boards. With every second guest some piece of equipment was hauled into the workshop and a flock of curious geeks emerged around it to carefully examine the patient. Norbert dropped a small 700kg CNC machining centre out of the back of his van, Stefan carried an F45 column straight to the AXA VMC, I (Shu) rolled in an SK30 TC spindle, the hackers from Münster picked up a trunk full of broken self balancing boards on the way to the meetup.. All of the tables were occupied within hours. Came from North London. He was designing a coil winder for an art project to manipulate ferrofluids in response to human interaction. A lot of coils need to be wound for that, so a coil winder would be of great use. 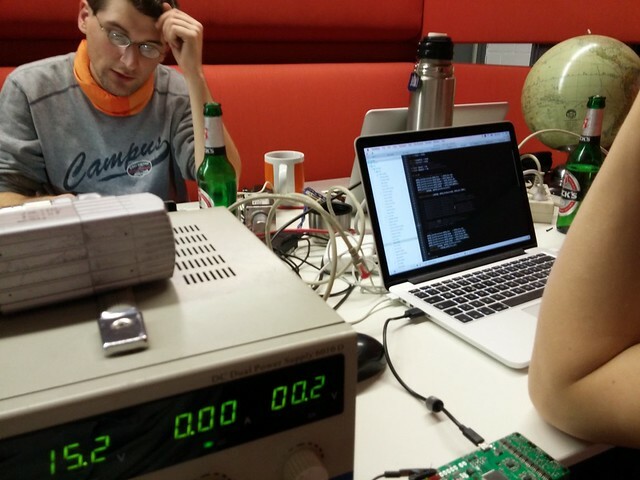 Is part of the London Hackspace. While I talked to him he was repairing a bearing of a self balancing board. Electrically it was working fine as he had already fixed a couple of them, including this one. It had all of the discrete h-bridge MOSFETs toasted - they were not insulated and slapped right onto the heat sinks, thus roasting themselves at the first boot. Frederik is just 18 years old, but has an impressive experience when it comes to fixing things and tinkering with electronics. If you noticed a small drone the size of your palm whizzing past you it was most probably him flying with his tiny FPV drone racing around the cnc machines. 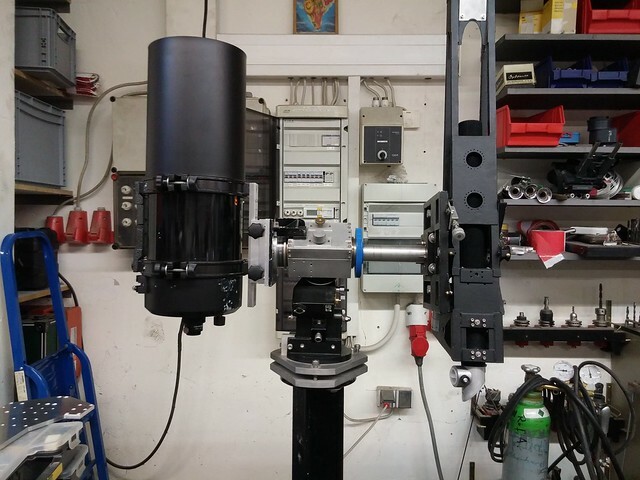 Overhauling a telescope mount and building an open source telescope controller. He brought a set of tapered roller bearings to put into the mount of his Celestron C8 reflector telescope. Host and owner of the shop we spent the meetup days at. Interested in MachineKit? on a BBB for exhibition purposes. Says we have a very diverse yet harmonic group this year. Spent a couple hours bootstrapping a CNC router for the Warpzone guys (Hackspace in Münster). 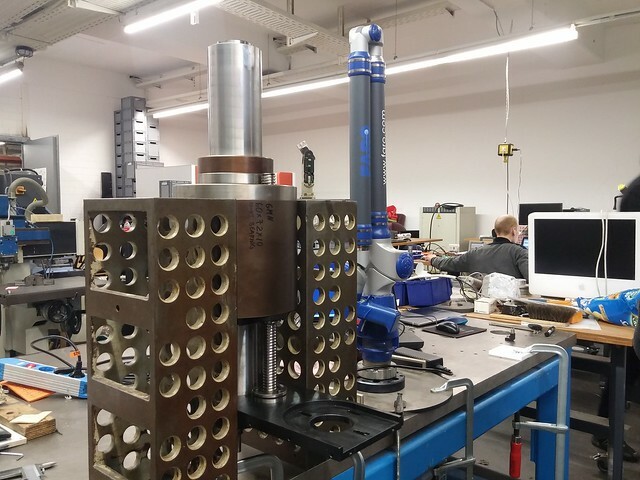 They dumped a stack of aluminium plates, extrusions, servo motors and linear modules with integrated rails and ball screws right in front of Andreas' Bonsai, his scratch built CNC mill. 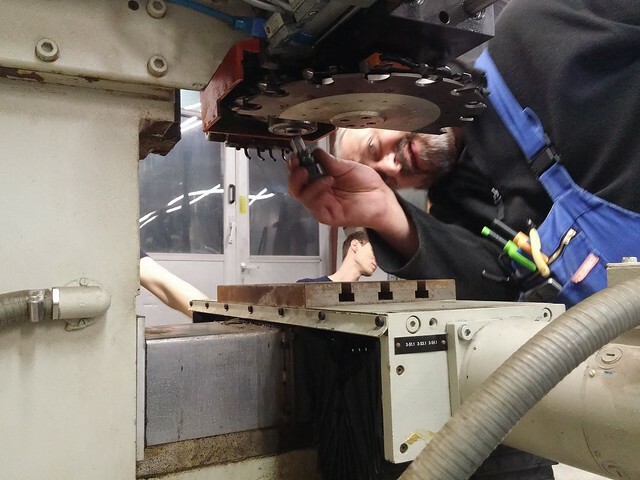 Andreas supervised the construction and cnc machining for the parts and thanks to the expertise present another frankensteined CNC router emerged in just three days. In general, Andreas is awesome at supporting everybody. His expertise is always of great value when you need a hint with your prototype. His impressive stock of parts and tools left everyone in awe and jealousy. Although maybe not Ingo, who's running a shop where he casually makes custom PKD carbide tools and then machines ceramic compounds for scram jet engines with top notch machining centres. Says he is learning a lot, tinkering around with these geeks. Alex implemented a tool changer user interface for the small VMC together with Norbert, and in general the little VMC was the primary patient and got a fair bit of attention. Signals are all connected, just the logic has to be finished in LinuxCNC. Converted the Solidworks model of the parametric speaker (an ultrasonic sound projector) to Rhino, so we can easily get some data out for the portal router that doesn't run LinuxCNC yet (horrible! But never change a running system?) Also he just made five coffees with the lovely Coffee machine! 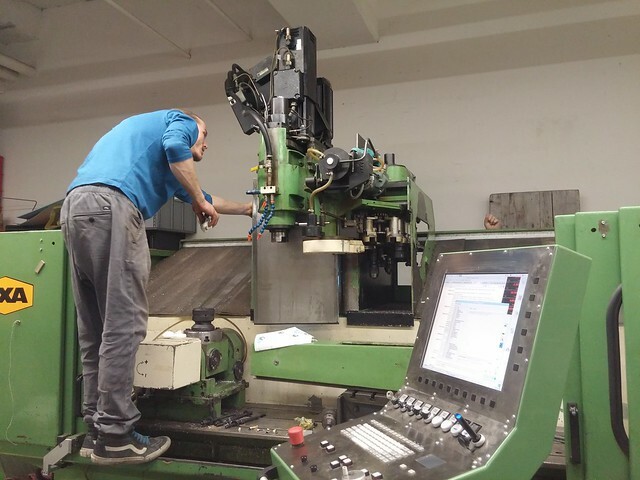 He is CNC milling the Z-column of his F45 milling machine on the AXA VMC. Right now the AXA is tapping 67 holes in the Z-column. It's tough cast iron, but easy work for the AXA. It's just a 1h job, but took about two days. At first just some minor adjustments were planned for the AXA to get it set up for the job, but we discovered that the Z ball nut was not lubed up. Turns out the oil pump was working fine for all the other bearings, but the one way pump valve for the Z ball nut branch is faulty. We disassembled parts of the machine head to gain more insights and cleaned the lubrication system a couple times to no avail. After ripping out the one way valve everything is working fine. He arrived here in his fully electric car. In general the hybrid or electric to ICE ratio is pretty good in front of the workshop. A true metal head with many tricks up his sleeve when it comes to conventional machining. Was busy most of the time fixing the Z axis of the large AXA VMC. The big lady threw a couple of tool holders due to errors in the Z offsets in the last few days, we found out that the ball nut is running dry as the lubrication is not functioning. Pretty awesome that everybody had a helping hand to offer. It is cool to get together with DIY Open Source hardware and software and slam in onto machines that are not supported by the manufacturers. These machines were so expensive and are still in great shape. It was also great to see a flock of youngsters. The youngest colleague on site was 16. Already looking forward to the next meetup.